Today’s Feature Friday spotlights one of our retail partners in Kentucky: Kenton. Kenton opened earlier this year in downtown Maysville. Kenton carries a variety of men’s clothing, shoes, and accessories, including an array of American-made brands. The store aims to provide men with attire that combines old world sophistication with a new modern twist. Maysville is located on the Ohio River in northern Kentucky. The small town holds a significant place in U.S. history. Given its proximity to Ohio, Maysville was an important stop on the Underground Railroad. Maysville’s downtown is decorated with historic murals. Among the murals is a tribute to the Underground Railroad. Another mural celebrates Rosemary Clooney, a popular singer and actress who was born in Maysville. Today’s Feature Friday spotlights one of our retail partners in Illinois: Gentleman’s Cooperative. Gentleman’s Cooperative was established in Chicago in 2013. Gentleman’s Cooperative specializes in custom clothing. The store sources fine garments and accessories from around the world. Gentleman’s Cooperative benefits from having an in-house master tailor who has over 25 years of experience in custom apparel. Chicago is the most populous city in Illinois and the third largest city in the United States. Chicago’s rich culture – from arts and music to professional sports – makes it a popular tourist destination. Chicago is well-known for its unique cuisine, including its nationally renowned deep-dish pizza. Lou Malnati’s pizza is a Dapper Classics Team favorite. Today’s Feature Friday spotlights one of our retail partners in Georgia: Simon’s Formal Wear. Simon’s Formal Wear has been Augusta’s premier formal wear destination for over 35 years. The store stocks a wide range of suits and tuxedos. If you live in the Augusta area and need an outfit for a formal occasion, Simon’s is the place to shop. Simon’s Formal Wear also has a Savannah location. 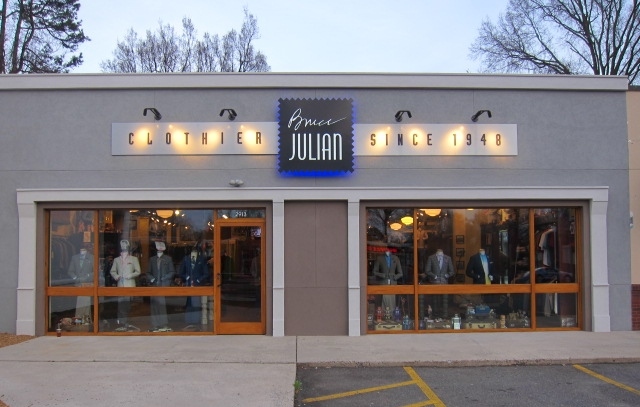 Today’s Feature Friday spotlights one of our retail partners in North Carolina: Bruce Julian Clothier. Bruce Julian is a second-generation haberdasher. His father, Milton, opened a successful men’s store (Milton’s) in 1948. Bruce Julian opened his own Milton’s location in Charlotte in 1977. In 2000, the store was re-named Bruce Julian Clothier. Bruce Julian Clothier provides a one-of-a-kind shopping experience. The store, which has its own bar, is decorated with vintage toys and collectibles. The shop offers custom clothing services and stocks a wide selection of stylish menswear. The store also carries its signature Bloody Mary mix. Charlotte is the largest city in North Carolina. The “Queen City” was named after Charlotte of Mecklenburg-Strelitz – queen consort of Great Britain. Charlotte has a strong sports culture. The city is home to the Charlotte Hornets (NBA), Carolina Panthers (NFL), the Wells Fargo Championship (PGA Tour), 3 NASCAR races, and the NASCAR Hall of Fame.